I think if I were to write my philosophy of education in one word it would be “rethink.” I love the power of looking at how we have done things and rethinking how we can make them different and/or better for today’s learners. As part of my work this year, we (a cross divisional working group) are examining the role that technology can play in raising the bar on assessment. We are using Bloom’s Taxonomy and the SAMR model as our benchmarks in this process. This graphic from the great Kathy Schrock, is a spectacular guide for us. 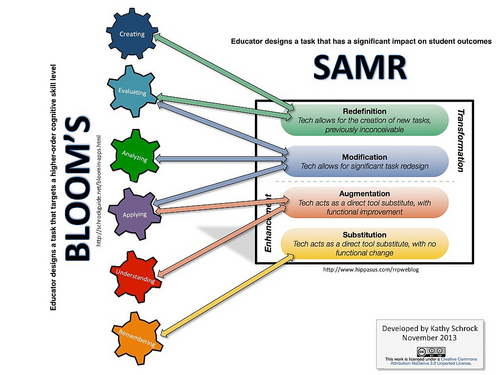 Our current task is identifying places where we are already moving up the continuum of SAMR. From there, we will explore new places as possibilities to move to re-definition. Along side this process, we are looking at the scope and sequence for technology instruction based on the ISTE standards. What are the philosophical and pedagogical implications for moving towards more integrated technology in the classroom? There are so many more questions than answers at this point and that is tremendously exciting. There is great potential at hand. I am grateful to the working group for the opportunity to grapple with these ideas.